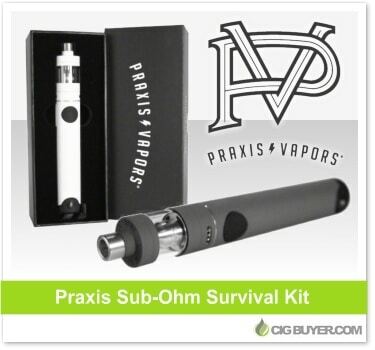 From the makers of the Praxis Decimus Mod comes a unique and stylish sub-ohm battery setup – the Praxis Survival Kit. There are similar (more affordable) options on the market such as the Joyetech Ego One, Kanger Subvod and Eleaf iJust, but the Praxis Kit is a high-end, designer setup developed in the USA. It includes a 2500mAh battery with a spring-loaded 510 and a minimum resistance of 0.2 ohms. The kit includes a Praxis Spitfire Tank with 3.5ml of capacity, adjustable airflow and derlin drip tip – with 0.2 and 0.5 ohm lighting bolt heads.